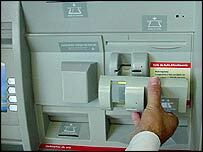 The skimming device is made to look like part of the ATM. A hi-tech scam that allows criminals to clone cash cards within minutes has been uncovered by Hampshire police. The "skimmer" device was found at an ATM in Aldershot after £250 was stolen from a person's account. Within a minute of the card being used, thieves in London had cloned the card and got the pin number which allowed them to make withdrawals from the account. The "skimmer" fits over the card slot on an ATM and is designed to look like part of the machine. It allows criminals to electronically copy all the information on a cash card. Police in Aldershot are warning people to be extra careful when using ATMs in the area in case this scam is used again. Officers say if anyone is suspicious that a cash machine they have just used has one of these devices on it they should call the police immediately as the thieves may still be nearby.